Whether in their twenties or sixties and whether they hail from the Virgin Islands, St. Lucia, Dominica or Virginia, everyone is working frantically on St. John and St. Thomas. It’s a post Hurricanes Irma-Maria race to repair and rebuild in time to salvage the usually tourist high season months of February and March. Everyone is sweating and too busy for conversation. Galvanized metal roofing and any kind of window are in short supply. New orders are weeks and thousands of miles from being filled. Yet, islanders make do. Building owners work side-by-side with contractors and day laborers. Dented cars and pick- up trucks with cracked windshields and fenders patched together with duct tape and plastic fasteners carry available supplies to hundreds of job sites throughout the greening, blossoming hills. 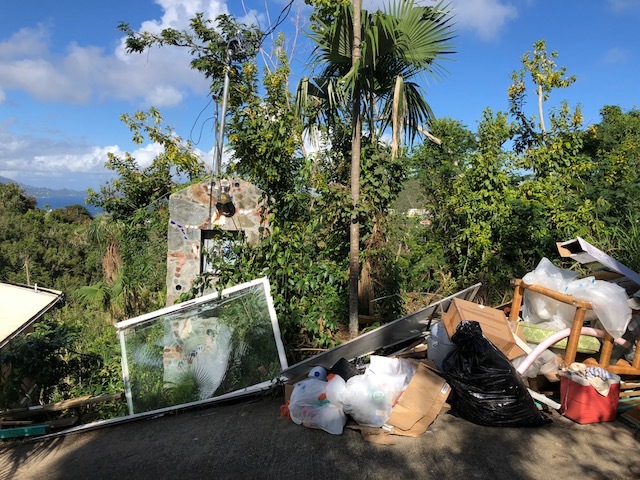 Once unloaded, the refuse of blown out walls, mangled roofs and dead appliances is hoisted aboard and taken down to overflowing dumpsters and collection points. What can be saved is reused. My family waited four months for electricity to be restored before returning to our St. John home. So, we are playing catch-up with hurricane repairs, mold eradication and searching for materials. We work side-by-side with carpenters from the British island of Dominica – best known as the bread basket of the Caribbean before devastated by Maria – and young boat captains and crew beached indefinitely by the loss of their vessels and employers. They are skilled mahogany and teak refinishers and painters. Three days before Irma struck, we had fled the islands to our cabin in Virginia’s Blue Ridge. Friends who stayed and survived the maelstrom are eager to tell their stories. Some are harrowing. A photographer spent the early morning of September 6 battening down his family home built in the 1960s and picking his spot to ride out Irma. As the winds picked-up, he heard the second story tearing away. Soon after retreating to an interior closet on the first floor, that level’s windows and doors were shattered and carried away. Oddly, he found himself covered in paint. Irma’s 200 mph-plus winds stripped the paint from exterior walls, coating everything inside. Nearby, a neighbor sought cover lying on the floor under a kitchen table. When his home’s roof, walls and even the table were blown away, he crawled out and over the rubble to his car. Fighting against the wind, he got the door open and climbed in. For four hours, he crouched down on the floor boards as Irma devastated his neighborhood. He was lucky. Many cars parked on mountain properties were blown over and pushed down the hills. And, there is the middle aged school teacher who, with a couple dozen mostly elderly folks, gathered at the congregation hall of the Bethany Moravian Mission. Built on a hill top in about 1750, the hall and adjacent church are among the oldest surviving structures on St. John. It was a designated storm shelter. A few hours into Irma, though, the wooden shutter-clad windows were rattling violently and men moved the kitchen’s refrigerator up against the front door to keep it from blowing in. It was to no avail. Sections of the roof tin and heavy timbers peeled away, disappearing in the rain. Then windows blew out from the inside and all were huddled together on the old stone floor. The teacher kept their spirits up by leading them in singing hymns as the storm raged. Miraculously, no one was hurt. They stayed in the wrecked mission for a week. Water and some food had been stored there. Irma passed over during the day. That night was so hot and airless that many who still had homes lay naked and dazed on their beds trying to sleep in the heat. An artist friend heard a strange noise on his property. He grabbed the machete he always kept next to his bed and in his birthday suit burst from his front door waving the blade and yelling. He chased away the startled looters who left behind pickings from a neighbor’s house as they raced down the hill in the dark, climbing and jumping over piles of rubble in the road. Many such year-round residents are not concerned with preparing for visitors. They focus on basic things: survival on islands with now scarce medical services and no accredited hospitals; getting gutters back-up to channel precious rain water to cisterns; rebuilding stronger structures. They need their repairs finished before the next hurricane season. Virgin Islanders display the kind of everyday courage associated with war zones. At first, they struggled for food and clean water as they used bare hands and hand tools to burrow out of debris fields, trying to secure their homes. Many used buckets lowered on ropes to get water from their cisterns. With the roads now cleared and electricity restored to most households, the battle for recovery has escalated to engagement with power tools. One hero of the storms is the hearty New Englander who owns and operates St. John Ice Co. Throughout both Irma and Maria he remained open for business, providing desperately needed ice and gallon jugs of clean water – even as the building housing his two stories of machinery lost exterior walls and sections of roofing. 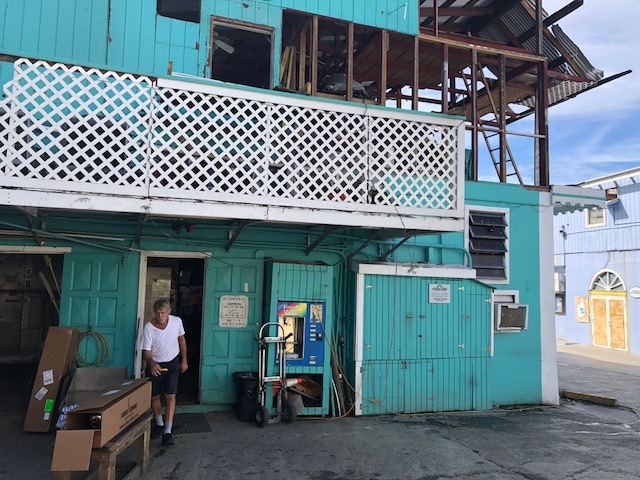 Located in the hard hit commercial complex known as the Lumberyard, St. John Ice continues operations powered by a large generator because the owners of the structure refuse to provide electricity as they decide the fate of the heavily damaged wooden buildings. Meanwhile, our beaches are now wider than ever and virtually empty. With so many trees trimmed and buildings swept away by Mother Nature, our mountain side views of the Caribbean and neighboring islands are more expansive. Old timers say they have their island back, remembering the 60s and 70s before visitors and protected forests took over. Back then, many hills were still used for cattle grazing or had been just a few years earlier. 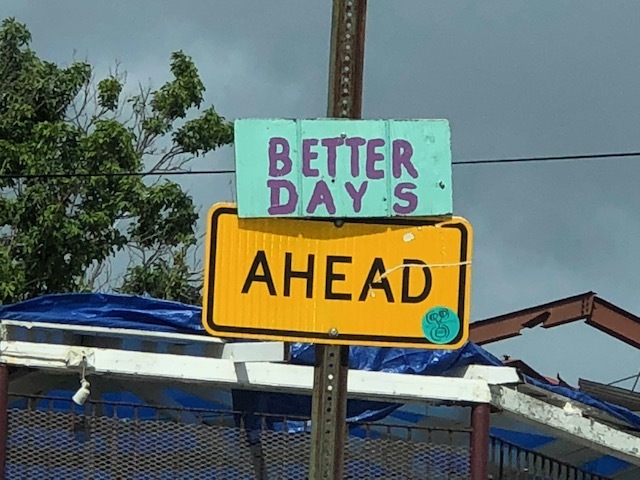 The spirit of St. John’s people is driving the recovery. The island is as beautiful as ever. Hardy visitors willing to make do in return for a breathtaking experience are invited. Bring work gloves.